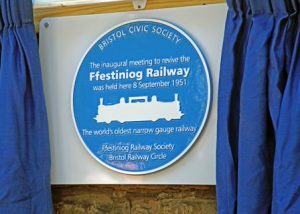 A blue plaque has been unveiled to commemorate a meeting held in Clifton which resulted in the revival of the Ffestiniog Railway in North Wales. It also led ultimately to the formation of the Ffestiniog Railway Society. On 8th September 2016 around 30 supporters of the railway and others gathered at St Mary’s House, Tyndalls Park Road for a buffet lunch and then adjourned to the nearby corner of Woodland Road for the ceremony. Leonard Heath-Humphrys lived in Anglesey during the Second World War and in 1950 became familiar with narrow gauge railways servicing the slate quarries. He was concerned with the state of the Ffestiniog Railway which at that time was closed and sought support for its survival. He called a meeting (with a handwritten letter) of interested parties on 8th September 1951 at 36 Tyndalls Park Road and thirteen attended. They were somewhat surprised to discover that Leonard was a seventeen-year-old schoolboy. After short speeches by the Chairman of the Society, Howard Wilson, and Mark Smith, Vice-Chair of the Heritage Railway Association, Tim Maynard as Chairman of the railway’s Bristol Group invited The Honorable Sir William McAlpine to unveil the plaque. We learned that the Ffestiniog Railway Society has 5,500 members scattered worldwide with regular volunteers travelling to North Wales from as far afield as Switzerland and California. The railway itself turns over some £5m annually and contributes upwards of £15m to the local economy of North Wales. This plaque honours primarily the building where that inaugural meeting took place. It also commemorates Leonard Heath-Humphrys’ remarkable ambition and vision, particularly for one so young. The plaque depicts a Double Fairlie locomotive in outline: a world emblem of the Ffestiniog Railway.